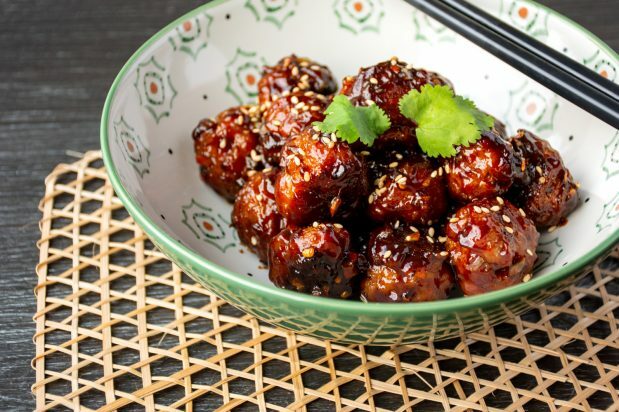 In a large bowl, combine minced pork thoroughly with soy sauce, sesame oil, corn flour, salt and white pepper. Add minced mushrooms, carrots, garlic and shallots. Mix thoroughly until well combined. Marinate the meatball mixture in the refrigerator for at least 3 hrs or best, overnight. Remove from the refrigerator and mix again. Using hands, press the mixture together so that the ingredients bind together well. Preheat oven with fan at 205°C. Place aluminium foil over baking tray and lightly oil the surface of the aluminium foil. Roll meatball mixture into balls of 3-4cm in diameter and place onto the well-oiled aluminium foil. Bake for 20-25 mins until browned. In a sauce pan, add in 1 tbsp oil and heat over medium. Stir fry garlic and ginger until fragrant. Add in hoisin sauce, rice vinegar, soy sauce, sesame oil, sugar and red pepper flakes. Stir over medium low heat until well combined and sauce has thickened. Throw in baked meatballs and stir gently, coating each piece with sauce. Transfer to serving dish and garnish with white sesame seeds. Serve hot with steamed rice.